Los Angeles locals live in a city bountiful with culinary offerings of various cultures. But sometimes, dining is more than just food, it’s about the overall experience… and that’s exactly what La Boucherie was for us. The team at the InterContinental Los Angeles Downtown hotel recently invited us out to a dinner at their steakhouse, the La Boucherie. Dubbed a “steakhouse with a French twist”, La Boucherie is located inside the InterContinental in DTLA, blocks away from Staples Center. 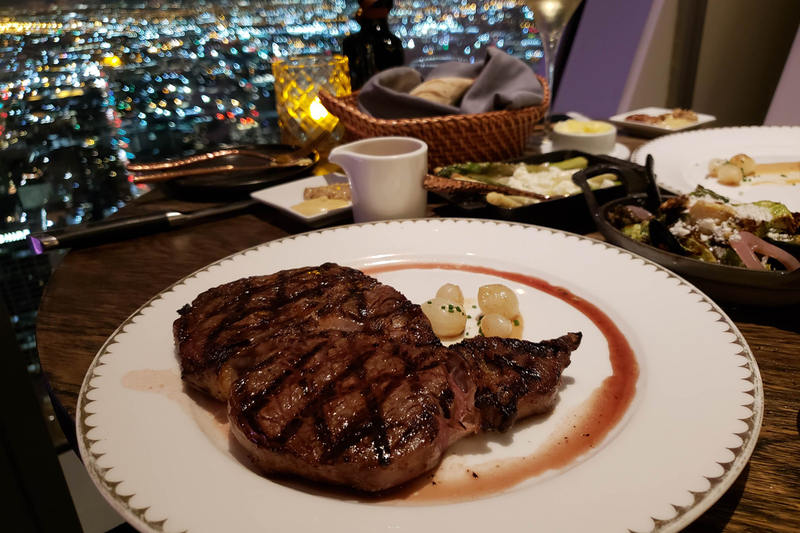 But when we say experience, it starts with the stunning views of Los Angeles, because the restaurant is located atop the hotel, on their 71st floor. Where do you start? The wine of course. La Boucherie boasts an impressive selection of more than 1,200 labels of handpicked wine, many of which are either French or local labels, ranging anywhere from $15 to $40 a glass and up. Can’t remember the exact label we sampled, but we tried a few and they were excellent. The waiter and the — is the assistant waiter? not sure. — were very helpful and knowledgeable when it came to pairings and suggestions, so don’t be intimidated by the wine or dinner list. They were courtesy and happy to help. After some appetizers, I ordered up the 42-day dry-aged rib-eye ($95). 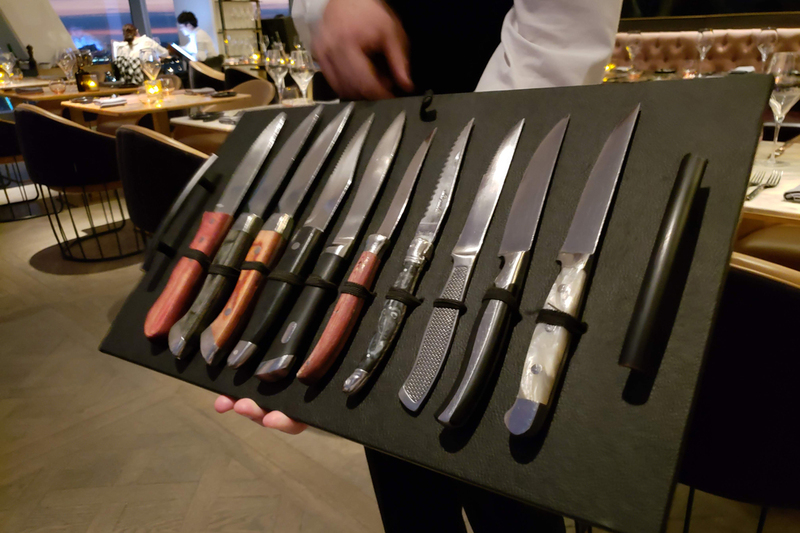 Before the steak came, the waiter presented a selection of special steak knives to choose from, each with their own unique story and origin. Then, you are presented with a variety of mustards the main chef creates to accompany your steak, each with its own twist. And finally, you choose your salt: Himalayan sea salt, black salt from Hawaii… you name it. Don’t know what to choose? Just ask. When the rib-eye came it was perfectly cooked and delicious. Definitely one of the best steaks you can order up anywhere. No doubt, excellent quality meat. After dinner, the dessert was next, and you may have seen it on Instagram, we tried the Mousse au Chocolat. It is a huge vanilla marshmallow dipped in chocolate and then lit on fire table side with rum. While it made for a Instagram-worthy food post, it’s a bit rich… so if that’s your preference, you should love it. Overall, our meal at La Boucherie was excellent — a steak doesn’t get much better than that. But overall, the experience and views is what impressed us. If you’re looking for a steakhouse and experience in DTLA, La Boucherie is one of our top choices. Maybe, a first date or dinner before a Lakers game? Either way, you won’t be disappointed. But… you will pay for it. It’s a high-end establishment, and a dinner for two — including drinks, appetizers and dessert — came out to over $400. With tip, around $500 would be the final bill. But… for a memorable experience with delicious food, it was definitely worth the price of admission. Special thanks to the team at InterContinental for inviting us to La Boucherie and showing us a good time. We were definitely impressed.